The mother of a boy with severe autism is again calling for better programing, co-ordinated leadership and help from the government. Carly Sutherland says her son Callum has to be locked in his room for his own safety. "The way that he responds is to be very violent towards my husband and I,” says Sutherland, “and our world has gotten smaller and smaller." Looking after her son is a full-time job and she hires help, but Sutherland is desperate for better support. On Thursday, Nova Scotia Premier Stephen McNeil added his thoughts. "The Minister of Community Services will be taking this issue to the National Social Deputy tables, around looking at a national strategy. The Minister of Health at the same time will also be doing the same thing," McNeil said. Callum has spent time at the IWK — a place Sutherland says isn't suited for his needs. 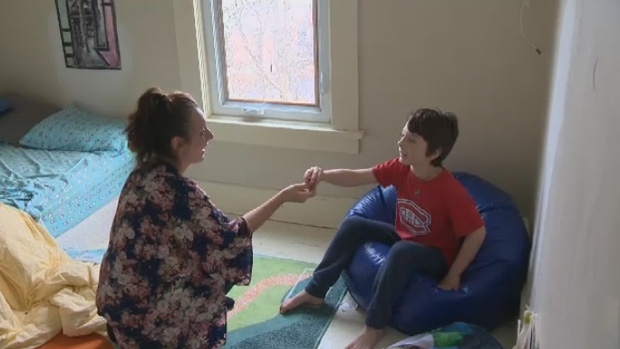 "They do not have Crisis Intervention Services for children with autism at the IWK hospital, so in Callum’s case he went to the Garen Centre for Children with Mental Health," says Sutherland. Sutherland doesn't blame the staff, saying they're working with what they have. But she says a unit for children with autism children is needed. "We have amazing people and researchers in autism spectrum disorders,” says Dr. Alexa Bangnell, chief of Psychiatry at the IWK.“I think there's always improvement we can do, and I would say a lot of that is cross-system – education, community services – but there is a ways to go in that area." Nova Scotia Health Minister Randy Delorey says he’s open to the idea of an expansion. An autism service review was done at the IWK, but it's as an internal quality review and not for external release due to privacy. Quality reviews are protected by law from disclosure, but Sutherland says she still wants to see the review. Carly Sutherland's son Callum has been diagnosed with a severe form of autism and has to be locked in a room for his own safety. Carly Sutherland believes the province and federal government need to be prioritize a national autism strategy.